Awesome 7BR/5.5BA Beach Home with Private Pool - Fully Renovated! Sleeps 25! Be one of the first guest to rent this fully renovated 7BR beach house! This house was professionally designed to include the colors and textures found here on the gulf coast and surrounding beach areas. It is the perfect place to host large groups, yet still has the intimate and inviting feel of a small beach bungalow. Some of the renovations in this house include an updated kitchen, all new furnishings, new decor, a custom built bunk room, and a newly renovated private suite. 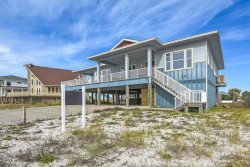 This house is perfectly situated on the famous Ariola Drive on Pensacola Beach! It has a deeded beach access just 5 steps from the Driveway . The property has an ample amount of out door areas for swimming, grilling, or just enjoying the views. The substantial in ground pool is the perfect place to cool off and be refreshed after a long day at the beach. This house, once discovered, will be a vacation rental favorite! It will be another highly sought after home like the others in our Ariola Drive inventory. This beach property is perfect for the large family or friend group vacationing together. The main level of the home has a large open concept which includes the kitchen, dining, and living room. It boast 6 bedrooms on the main level as well as 4 full baths and one half bath. A large laundry room can also be found on this level. The other bedroom and bath are on a separate level and was designed to be an in law suite or an additional get away for someone in the group . This property was designed to include sleeping accommodations for almost any group situation. Each bedroom has a flat screen tv as well as newly purchased mattresses. The bedroom layout includes two ensuite bedrooms. The main master bedroom has a king bed as well as a daybed/sofa that’s perfect for a child . This large bedroom also has a separate entrance that steps out to the deck as well as a large master bathroom. This bathroom has two separate sinks, a shower, and a large soaking tub. The other master bedroom has a king bed with the attached bathroom housing a large vanity and a tub/shower combo. Two additional bedrooms also have king beds and share a jack and Jill style bathroom. This bathroom also has a large vanity and a tub/shower combo. The additional two bedrooms on this level also share a jack and Jill bathroom. One of these bedrooms holds two queen beds and the other bedroom has two custom built bunkbeds with four queen mattresses. Another great feature of this home is the newly renovated bottom floor. This area is very private from the rest of the home and is easily accessible from the pool and parking areas. It includes, not only a sleeping area (with 2 queen beds), but also a sitting area with a large flat screen. This room also has a private bath with a tub/shower combo. This property was built in 2012 but was recently purchased by new owners. They spared no expense updating the decor and design to ensure that vacationers have an amazing experience while visiting our gulf coast. Come take advantage of all the new improvements and extra space while making vacation memories that will last a lifetime!